That word has been rolling around in my mind for months now. Hopefully, someone (or a few someones) immediately popped into your mind, along with flashes of all the amazing memories you’ve made together. However, if you’re over the age of 30, I’d venture to guess you had to think for a minute. Maybe you’re still thinking. Granted, I believe friendship changes as we get older; as we mature. Perhaps with age comes the diminished need for a large pool of friends, and possibly even distinguishing a BFF. Perhaps our needs and interests shift to cherishing deeper, more meaningful relationships, even if that means we enjoy fewer of them. Quality over quantity and all that. I’m turning 40 later this year, and in so many ways I’m more comfortable in my own skin—in who I am as a person and a woman—than I ever have been. However, in the area of friendship, I find myself increasingly self-conscious and unconfident. 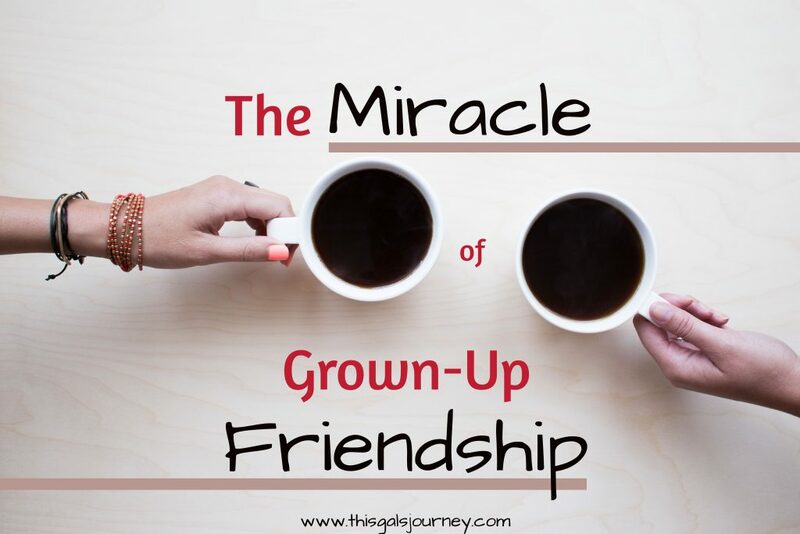 In chatting with a gal I consider my closest friend after my husband (incidentally, this friend lives several states over, and we’ve never enjoyed our friendship living in close proximity to one another), I realized that the last time I had a really close, deep friendship with someone in person was five years ago. Five. Years. Now, I’ve had wonderful friendships during that five year span. Just nothing as deep, personal, and intimate as the friendships I enjoyed previously. I’ve also come to realize, much to my chagrin, that I am far lonelier living here in America than I ever was as an ex-pat. A fact that shocks and saddens me. I literally laughed out loud, nodded my head, and then sobered. With 112,000 retweets and 440,000 likes, this thought clearly struck a cord. So, why is it so many of us in the 30+ demographic suffer such a severe lack of true relationships outside of family? To answer that, I think we must look at the source of the miracle itself: Jesus. When I look at those 12 close friendships Jesus enjoyed, I see what true friendship takes. I also discover clues as to why I think we are lacking in this area—particularly here in America. Jesus initiated the friendship. Jesus was the ultimate extrovert. I mean, other than in kindergarten, when was the last time you walked up to a person who looked somewhat interesting and asked, “Hey, wanna play?” Of course, Jesus was calling men to follow Him, but it’s basically the same thing. Jesus and those twelve men were practically strangers, but Jesus saw something in each one that He wanted to cultivate, to get to know. 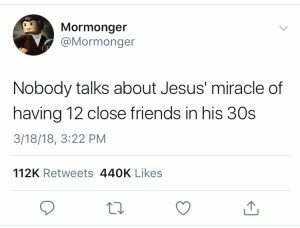 Jesus initiated the friendship, which is the very hardest part, in my opinion.What if they don’t want any more friends? What if they think I’m weird? What if I’m annoying? I think fear of rejection is what hold many of us back from reaching out to people we are truly interested in getting to know better. Jesus let His friends interrupt His life and plans. Friendship is costly. It takes time, energy, emotion, brain-space. Jesus let his friends interrupt Him, and not allow it to strain the relationship. My favorite instance of this is found in all of the Gospels (The books of Matthew, Mark, Luke, & John), but my favorite account is found in Mark. See, Jesus and His friends were on a boat at night when a huge storm came up. The Bible calls it a “furious squall.” Jesus, being Jesus, was asleep on a cushion in the stern. His friends started freaking out (as I’m certain I would’ve done) and wake Him up. Here’s the best part. They don’t just wake Jesus and ask for help. They wake Him and say, “Don’t you care if we drown?” (Mark 4:38b, NIV). Ha! Yeah. First of all, they interrupt His sleep. Jesus doesn’t get mad, He’s not cranky that they woke Him from a nap. That’s real friendship right there. Secondly, He helped them. They insulted Him, and He still helped them without snark. He calmed the storm, and then He did something else. Jesus called His friends out when it counted. After He calmed the storm, He called them out for their lack of faith. I mean, God of the Universe was there in the boat with them. That should’ve been enough. True friends call each other out on their bologna. My dad always says, “A true friend is someone who makes you better.” If you and your friends agree 100% of the time, something’s wrong. Real friends don’t let each other get away with things that will hurt them spiritually, emotionally, or physically. Jesus called His friends out on their bull, and that is no easy task. It’s so much more comfortable to put some sort of twist on the behavior/thoughts/words that make them seem ok, or at the least excusable. Jesus loved His friends too much to do that. 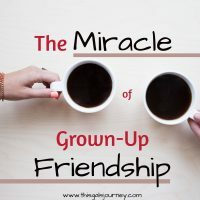 I think this is another reason true, intimate friendship is disappearing from the American adult experience—it’s easier to just keep to ourselves and not call a spade a spade when need be. Jesus put the needs of His friends above His own. I’m sure we can all agree, just about everything we do, we do with one goal in mind—to stay alive. Jesus, on the other hand, knew His death was the one thing His friends needed most. He didn’t want to do it. We see that in the Bible when He, not once but but twice, asks God if there’s anyway to accomplish His Plan without Jesus having to go to the cross (Matthew 26:36-45). Real friendship takes sacrifice. Of course, I’d venture to guess the vast majority of us won’t have to actually die for our friends, but real friendship calls us to die to ourselves day after day. To lose sleep while they talk through the loss of their job; to spend a few bucks of a cup of coffee or cook an extra meal when their life is in chaos. Even in times of relative calm, it takes a sacrifice of time, energy, and sometimes even money to maintain a deep, quality, vivacious friendship. The more I examine the friendships of Jesus, the more I understand why we may struggle with it so much. It’s costly. It’s uncomfortable. It’s unpredictable. Three of my least favorite things. But, just like anything of value in this life, the rewards far outweigh the costs. Of course, we must proceed with wisdom as we build those friendships that will speak most deeply into our lives. There are toxic people and toxic relationships. I’m not arguing that we should stay in dangerous or unhealthy relationships. But, I would argue, most of us could afford the cost of a true, lasting friendship. Could you? What a great message! Friendships are very important. Letting those friends know how special they are to us is very important, too. That is so, so true! We need to be sure we communicate our appreciate for those who are close to us! Terrific post, Jen! I love how you look at what Jesus did to model what He’d have us do for deep and solid friendships. Your point about sacrifice is SO key. That’s what I struggle with most–the putting of others first before my own desires, especially when it requires sacrifice. Thanks for this reminder that our Lord made the ultimate sacrifice and calls us to sacrifice our own interests for the sake of others, as well. That is indeed, true friendship!